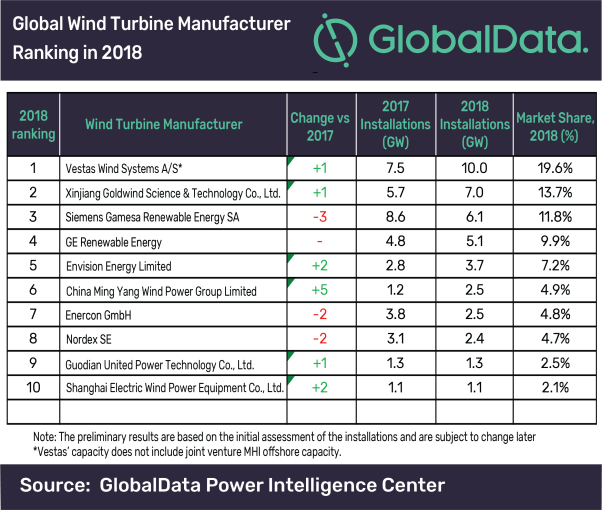 Vestas Wind Systems A/S has re-established itself as the leading manufacturer for wind turbines with over 10GW, or 19.6% share, of global installations in 2018, according to GlobalData, a leading data and analytics company. According to Vestas, high level of project commissioning in Americas, Europe, and steady installation activity in Asia-Pacific has aided the company to cross the 10GW mark for the first time. Ankit Mathur, Practice Head of Power at GlobalData, says, “Vestas has been among the top wind turbine manufacturers and has grown organically. Having secured its base in the key European and US markets, and a strong product portfolio, the company should now aim for other big markets where it has a minority presence”. In second position was China’s Xinjiang Goldwind Science & Technology Co., Ltd. with over 7GW of installations, representing around 13.7% share of the annual installations globally. Goldwind maintained its leading position in the domestic market with over 6GW of installations in China. GE Renewable Energy remained in the same position, with over 5GW of turbine installations in 2018. The company stated that the limited growth was due to pricing pressure, shrinking domestic market and an unfavorable business mix. Envision Energy Limited occupied fifth in the ranking, gaining two places compared to 2017’s ranking with around 3.7GW of installations, representing 7.2% of the share. Envision Energy continues to remain second in the domestic Chinese market.